Abstract> The Women’s Association of Chira Island began in 1999, in order to develop a unique ecotourism project in their community, Chira Island, in the Pacific region of Costa Rica. 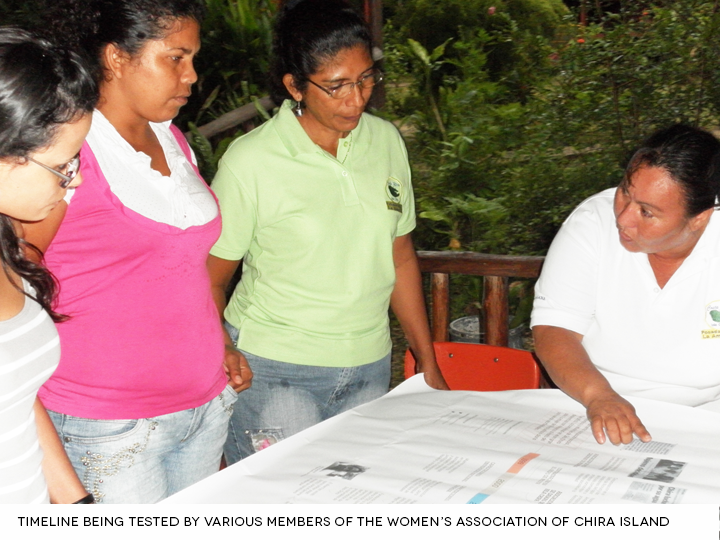 Although their project has been successful and received national recognition, the women have gone through endless obstacles and challenges to achieve their success, including changing their own thinking and questioning social roles in order for their project to work effectively in the Chira Island community. Now, they consider self-esteem to be their most important resource. 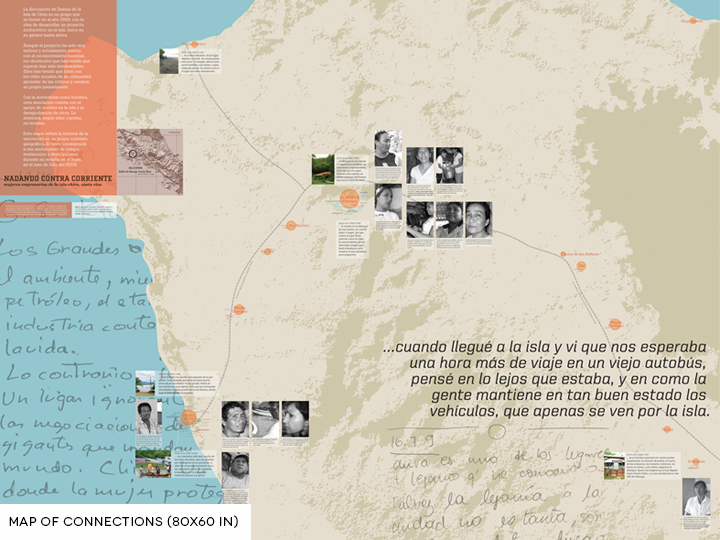 This creative project, the content of which was developed during three field reseach visits, using ETHNOGRAPHIC and DESIGN RESEARCH methods, employs the concepts of time, space, and voice to visually communicate the story of the women, their association, and the implications of their project for the community and their families. 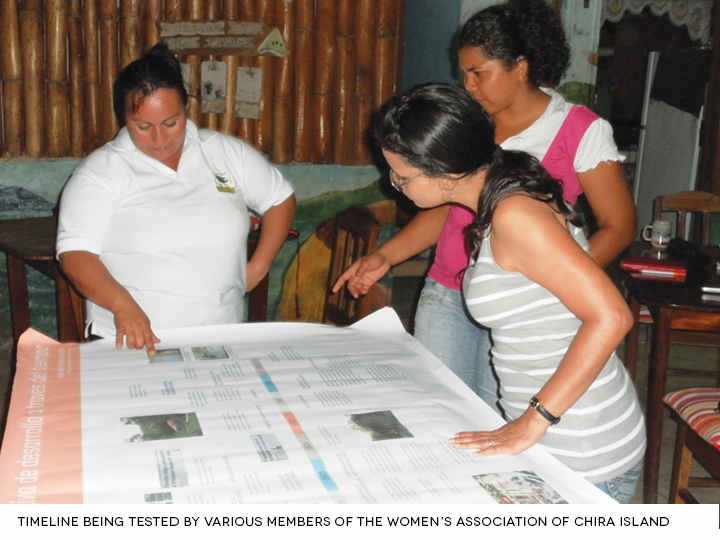 The resulting exhibition and related project materials, all designed for mobility and reproduction, are intended for the members of the association to use as their work inspire other women in rural areas in Costa Rica and Latin America to carry out their own development initiatives. With this project, I explored the value of STORYTELLING and how design research can incorporate different activities and field research methods to produce context-specific information, in order to encourage a kind of design that is collaborative and understands real-world needs. Being in direct contact with people, understanding their life style and motivations, instead of working in a vacuum, are activities that open spaces for discussion and collaboration to solve communication needs that can enhance the livelihood of a specific community. Map of Connections> This map was first developed as a book, composed of different layers in order to visualize economy, social roles, religion, the relation between the members of the association and their husbands, their relation with their families, the community, and their own personal backgrounds. Several evaluations of this map took me to the development of a larger piece, using only one layer to represent all the connections through color, but incorporating pictures of places and people, with the use of thick descriptions to contextualize the space and the life of the women of the association. 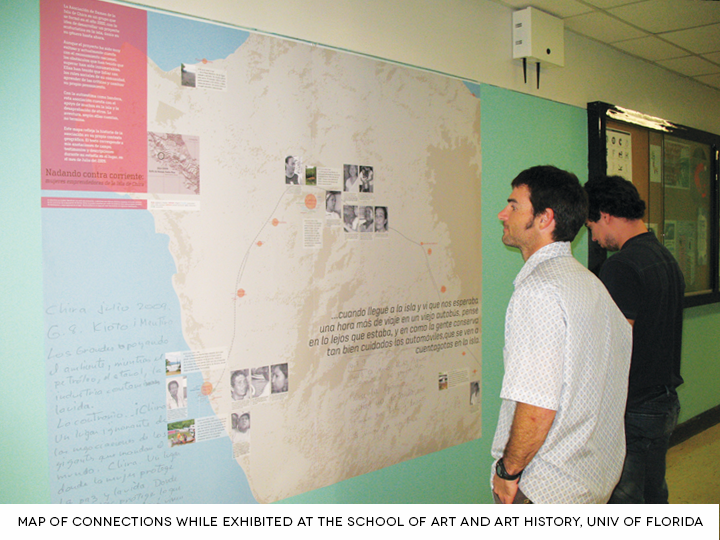 The final version of the map, which size is 80×65 inches, was first presented in December of 2009 to my Creative Project committee, other faculty members, and graduate peers. 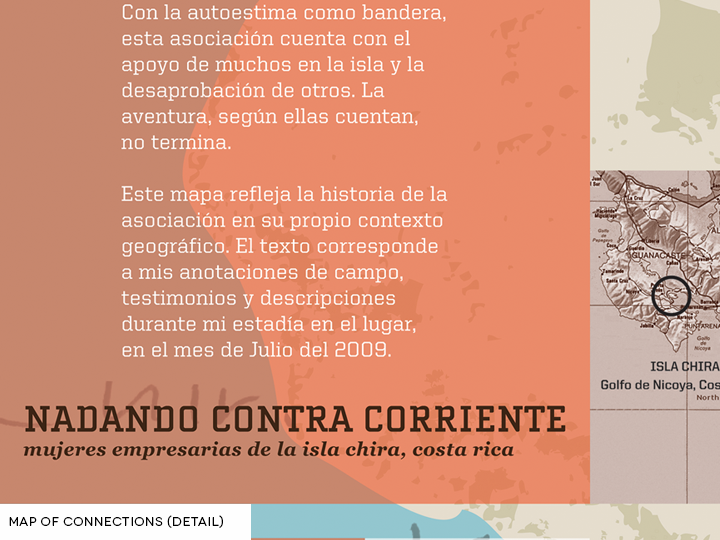 Later that month, I took the map to Chira Island to proceed with its user testing. This piece can be displayed alone, or it can be part of the whole materials system I created to visualize the story of the association in different ways. 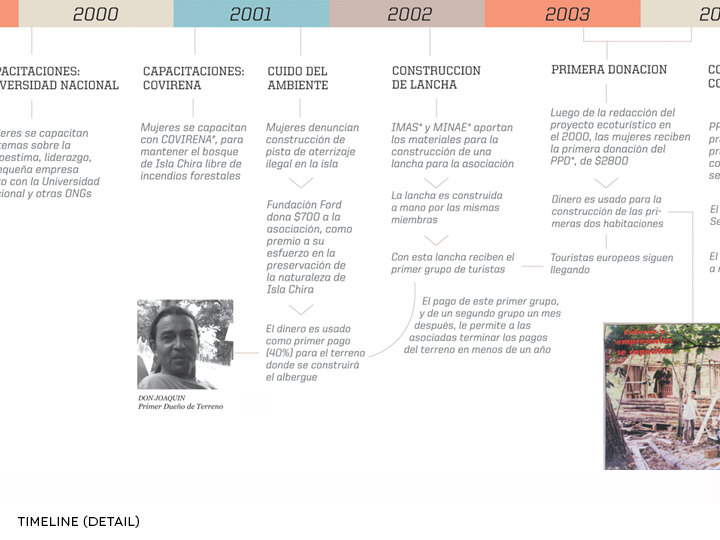 Timeline> After the definition and production of the Map of Connections, I started to consider more ways to represent the story of the association of women. I was already visualizing it in terms of space, but there were still many other elements and information about the story of the women’s association that needed to be communicated. 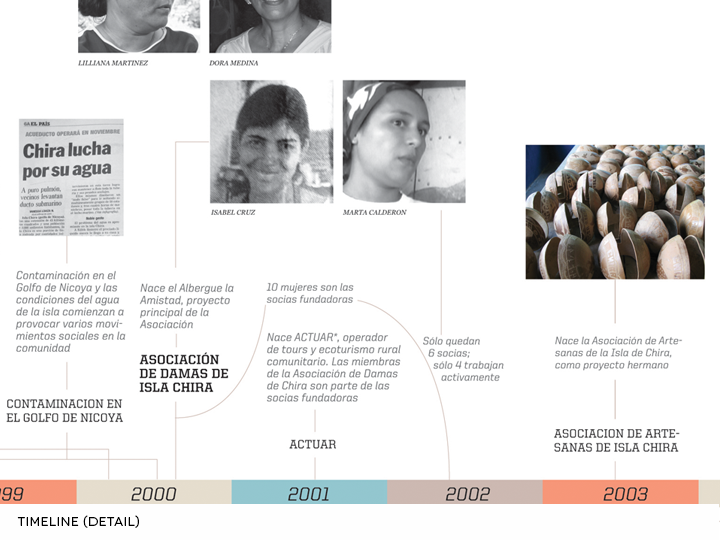 I developed a Timeline that represents ten years of story of the association. 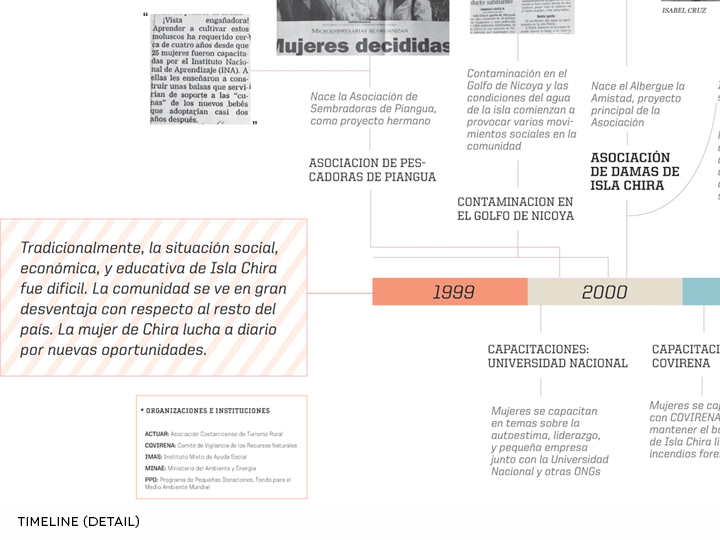 This Timeline is divided in two levels: the upper part has the facts that relate directly to the development of the association and its relation with other groups of people in the island, other associations, and their presence in the media. The lower part has the activities carried out directly by the association during those years. 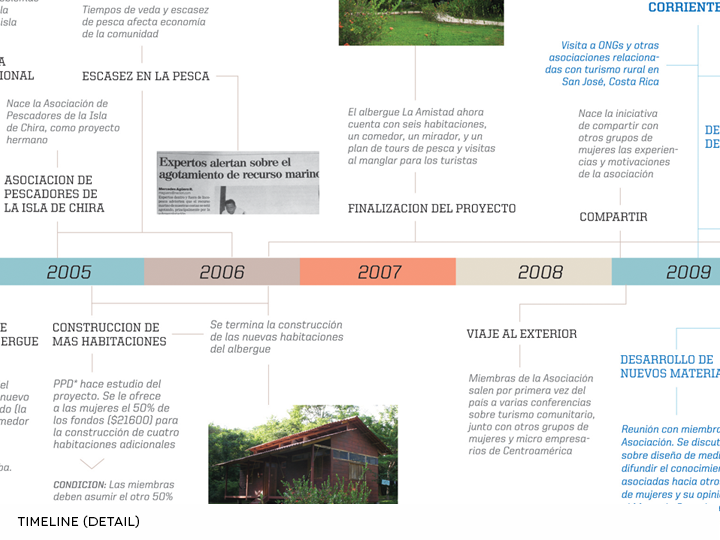 For example, the construction of the cabins in 2003 and their first trips to ecotourism conferences in Guatemala, in 2009. 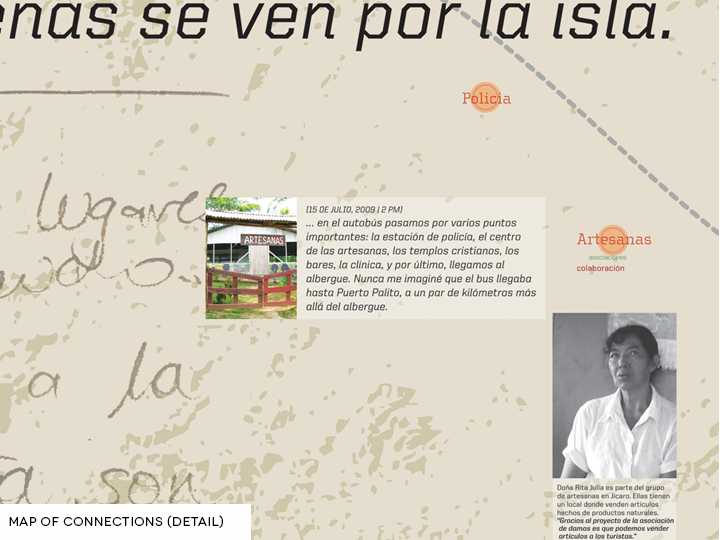 This Timeline can accompany the Map of Connections and the rest of the pieces (as a storytelling system), or be displayed alone, depending on the context and space it is used. This piece was also taken to Chira Island for its user-testing. Once again, I was able to share it with the members of the association and their families, who collaborated in the elaboration of the piece from Chira Island. “Altered Testimonies”> To support the Timeline, I developed a series of collages that derive from an altered book I created based on my field research activities and the life and story of the women’s association. These collages deal with different visual explorations of textures, colors, text, images, and interviews to the members of the association. 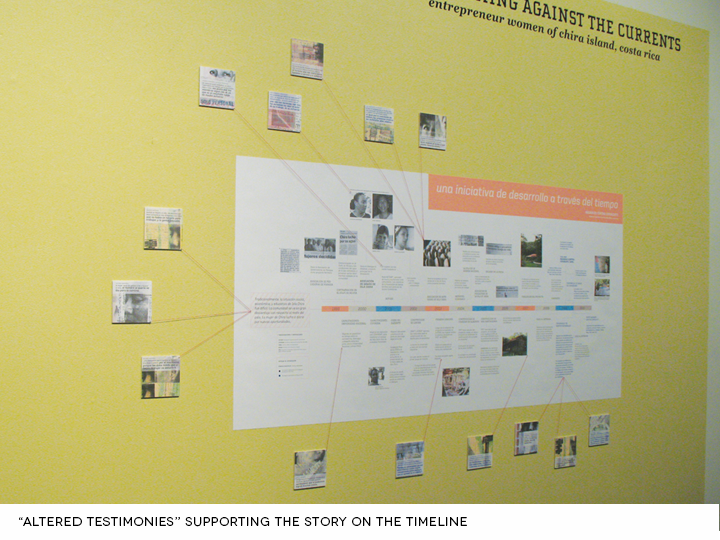 Mixing these mediums and excerpts of testimonies resulted in beautiful portraits of the story, where both the message and the visuals support different facts along the Timeline. 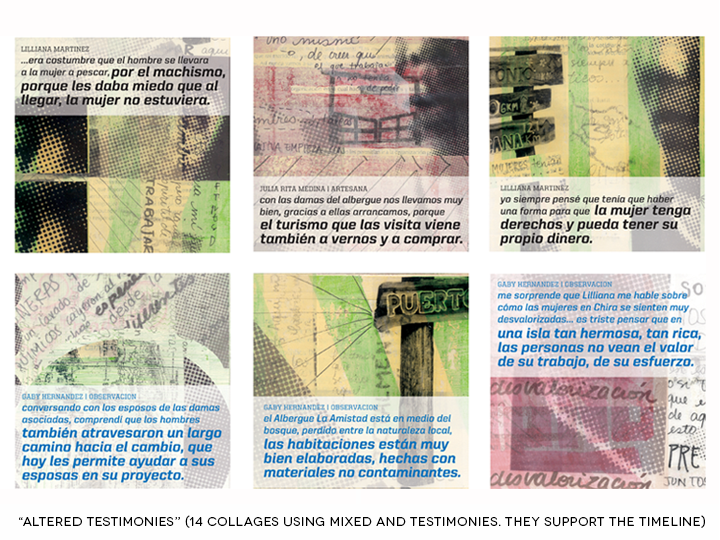 Cards of Testimonies> While working on the Map of Connections, I developed a series of cards called Testimonios. These cards are a collectable set of inspirational messages from the members of the association of women. 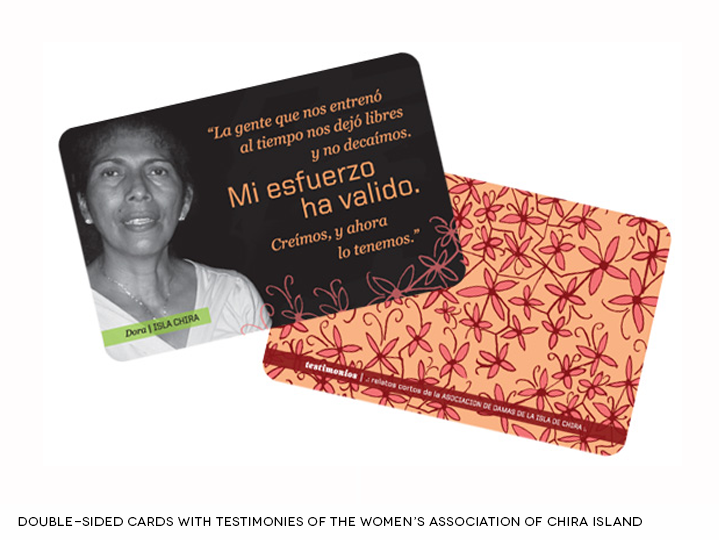 Each card shows a photograph of a woman with her corresponding message. On the back, there is a floral pattern based on the flora found in the lodge area. Video> In order to keep representing the story of the women’s association through voice, I developed a twelve minute video. 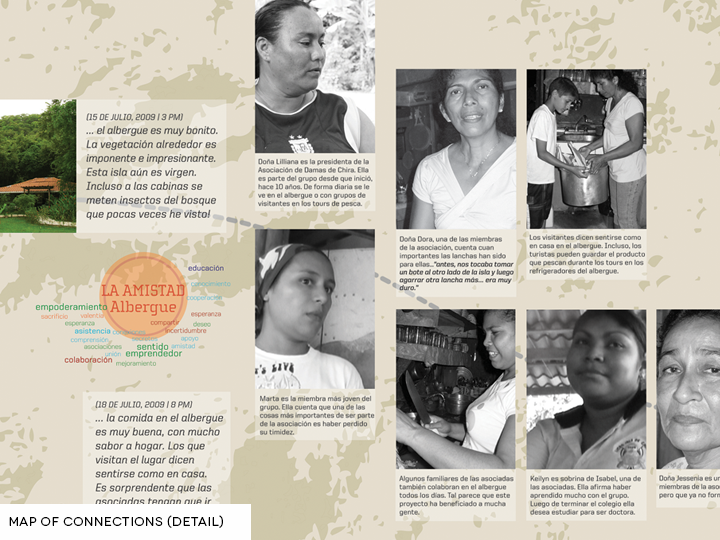 It is divided in chapters, where the women speak about the beginning of their association, the limitations that women in the island have had to improve their economy and livelihood, and the planning of their ecotourism project and support they got from different entities. This video is based on recorded interviews from my first field-research visit to the island. 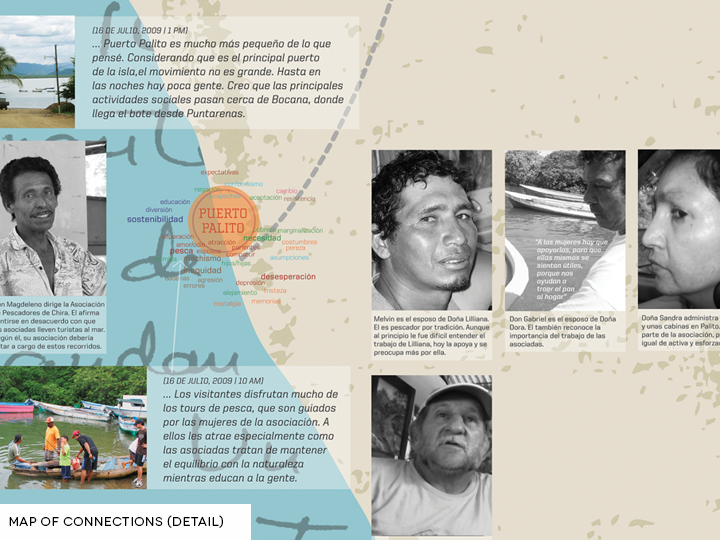 These interviews were made in different spaces, such as La Amistad Lodge and Palito Port. The order of the arguments and the facts presented propose a solid overview of the story of these women, told by themselves. 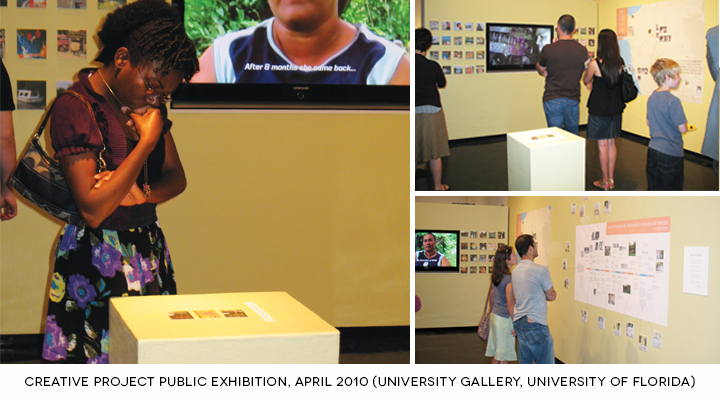 Public Exhibition> The project materials were exhibited at the University Gallery of the University of Florida in April, 2010. They were presented as a complete unit, working as a group to present all the different ways that the story of the women of the women’s association can be visualized. 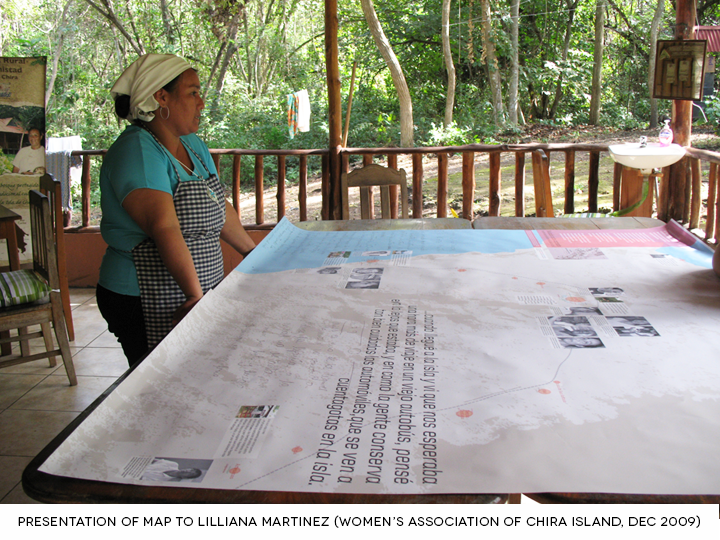 Since the main audience of this project are women in Chira Island, and other women in rural areas of Costa Rica and Latin America, all the pieces were created in Spanish. For this specific exhibition, I provided a project abstract in English to help the audience understand the project and digest the information. At the same time, the video has subtitles and chapter introductions in English. 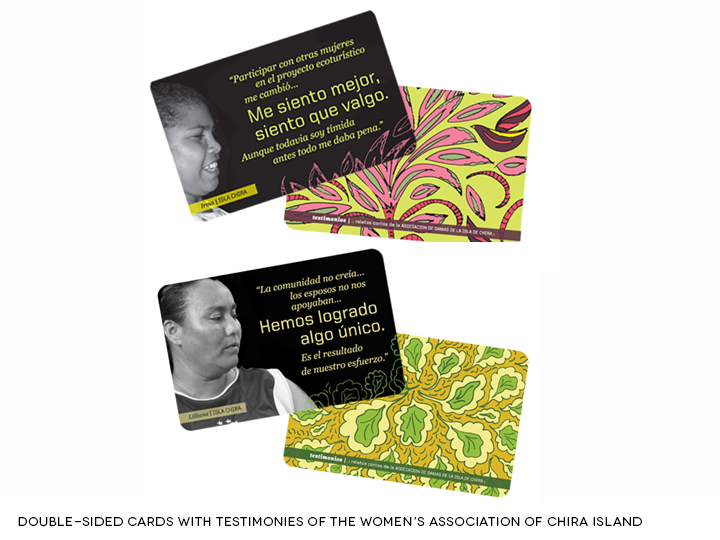 The materials are intended to be light in weight, easy to reproduce and mobilize, given that these are to be used by the members of the ADIC to represent their story and inspire other women with their work and experiences, in different contexts and spaces, including their lodge in Chira Island. 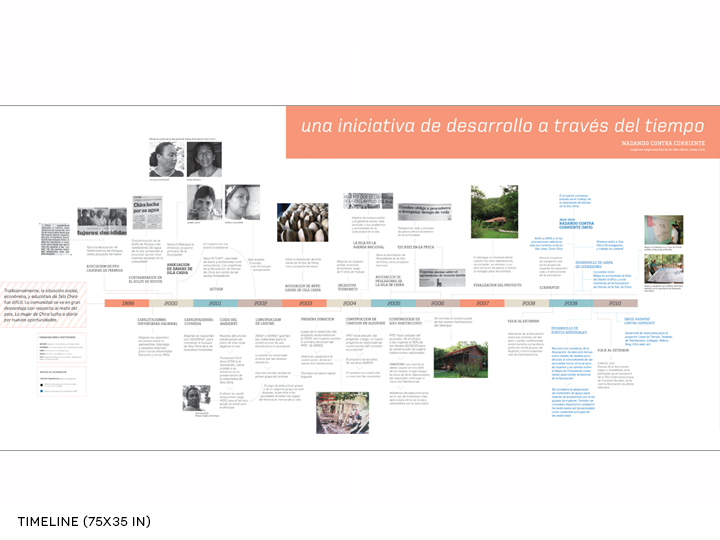 Final Creative Project Book> I wrote and designed a book with the methods used in this project, along with my experiences in the field and with the different members of the Women’s Association of Chira Island, their families and the community. Details of the design process of this project outcomes, prototypes, and other important information can also be found in the book. You can access it below or through this link.